Every goddamn day: 04/21/19: You're not really wearing that wetsuit, are you? You're not really wearing that wetsuit, are you? Kudos to the mayor, not only for doing the Polar Plunge on Sunday, assuming he follows through, but for enticing new “Tonight Show” host Jimmy Fallon to join him. And give Rahm extra credit for gulling Chicago Public Schools children into thinking he was making some kind of sacrifice when he made a bet, vowing if they read 2 million books he’d jump in the chilly lake. This is the same Rahm Emanuel who’s the triathlete, right? Who regularly jumps into the lake of his own volition, for fun? Then swims a half mile while he’s there. OK, maybe not in this cold. But it isn’t like he’ll be in the lake for long, and if he wears that wet suit he’s been brandishing, he’ll be neither cold nor wet, really. That’s like me making a bet where, if I lose, I have to go to the opera. 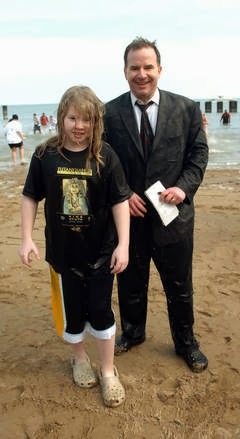 Having done the Polar Plunge, six years ago (in a suit and necktie, by the way, as Fallon says he will do — in comedy, there is nothing new under the sun), I can tell you that the discomfort of the thing, as with most daunting tasks, is all in the contemplation. Ohhh, the lake is chilly. Ohhh, I’ll get wet. Ohhh, what did I get myself into? The Polar Plunge is basically a daylong lakeside party, the clever combining of doing good and boozy blowout that makes for successful charity events. As the former charities, foundations and private social services reporter for this paper, I always view such parties as a philosophical quandary: Are fun elements added to charity events to make them more popular and successful? Or are charity elements grafted onto fetes and beach bashes in order to shave a bit of the End of Rome frivolity off them? Rich swells like to gather for balls but eventually felt guilty, so they invented the dodge of tossing a bit of the glitter at the needy. Or am I being Debbie Downer? I'm not really one of those grim scolds who say, "You know, you could skip the five-course dinner at the Peninsula and the 20-minute set by Chaka Khan and just send all the money to charity..." That misses the point. A spoonful of sugar helps the medicine go down. People are complex, and passing the hat for Special Olympics wouldn't be one-tenth as successful as goading folks into jumping in the lake. Believe me, hounding helps. I did the Polar Plunge not because I'm a nice guy, God knows, but because I got tired of being bugged by Michael Sheehan to do it, and it was easier to jump into Lake Michigan than to keep saying no. Being hectored into doing something, Jimmy, or doing it because you lost a bet, Rahm, doesn't make you a hero. The person whom I really admire for doing the plunge is my elder son, who was 12 at the time, a pale, 75-pound chess fanatic with long blond hair, as tough as an orchid, who accompanied me to the Polar Plunge to watch, or so I thought. But as I went splashing in and fell face-first into the 33-degree water, he followed me, spontaneously. No fanfare, no premeditation, no press hoopla. And he never spoke about it again. So remember, the plunge is fun and it's cool, literally, but it's no big deal. The point of the thing is to raise money for Special Olympics, which is a big deal. Good for the mayor and the TV host for drawing attention to the plunge and Special Olympics, but a gentle reminder to keep the attention on the plunge and Special Olympics, and not lavish it all on the two big egos dampening themselves for a good cause. One more thought: None of this mincing up to your knees, squealing and cringing, and then running back as if you had done something. Total immersion, boys. Think optics, Rahm. If you do it in that wet suit, it'll be Michael Dukakis driving the tank all over again. The Jack Higgins editorial cartoon will haunt you to your grave: He'll add a face mask and snorkel and Bears blanket. No wet suit. If you're going to jump in the lake, especially after all this buildup and hand-wringing and self-glory, then really jump in the lake. A child could do it. "Tough as an orchid" - love it! That long hair had to go. Not a healthy thing to do. "This is not the hill to die on." "Death is not an event in life"
"Soon we will marry and our woes will vanish"
Divvy Diary: Why did the rooster cross the Loop? Meh: This year's Super Bowl commercial fall flat. A new meaning for the term "dog house"